If you follow the poker world closely, you should know that Ted Forrest is known for his outlandish prop bets. Well, on Sunday, Forrest and Matusow entered into a prop bet of their own, and it will be interesting to see whether or not Matusow can win the bet. 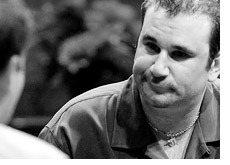 According to Matusow, it will be a piece of cake and a slam dunk. Forrest bet Matusow $100,000 that Matusow can not drop enough weight to weigh in at 181 pounds by this time next year. Matusow currently weighs in at 231 pounds. So if Matusow drops 50 pounds over the next year, then he wins the bet and $100,000. According to Matusow, he has an "amazing" metabolism, and could lose 50 pounds in a month if we wanted to. Matusow claims that he spends "24 hours a day in bed playing online poker" and eats "a whole pizza and two hamburgers per day." All of this food, and Matusow claims that he has only gained 30 pounds over the last year. When there is money involved, Matusow goes on to say, I'll drop the weight with no problem and Forrest will be paying up. If Matusow truly does eat a pizza and two hamburgers per day, then we hope for his sake that he does win this bet, or else he'll be dropping dead of a heart attack.